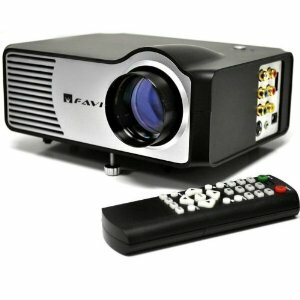 The FAVI RioHD-LED-2 is a low cost, portable projector that is super easy to setup and pack away. It has plenty of connectivity options and is great for watching movies or showing the odd slideshow, plus it looks cool as! We highly recommend picking one up. 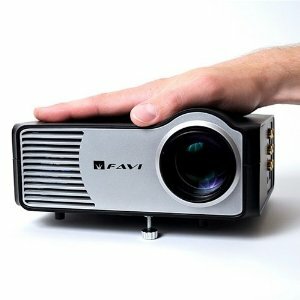 If you’re after a low cost, portable projector that is super easy to setup and pack away then you should definitely check out the RioHD-LED-2 mini projector from FAVI. 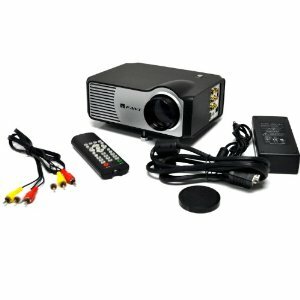 This is a sweet little projector that is great to setup on a wall for a big session of gaming or even a fence for some fun outdoor movie entertainment by the pool. The FAVI RioHD-LED-2 has a huge range of connectivity options considering it’s price and is definitely built to cater for a large range of audiences. The lighting system is LED rated at a nice long 20,000 hour lifetime. Which means no bulbs to replace, pretty much ever. Image quality is fair and it handles a good range of lighting scenarios including outdoor with a decent projection distance up to about 120″ (3m) and manual focus to help adjust the image. The VGA port is really handy, especially if you’re using a modern operating system that handles hot plugging of external displays. It really enhances the plug and play experience when you can fire it up quick and plug in your laptop. The in-built speaker quality, as with most mini projectors, is pretty rubbish. Just skip them and plug in some external ones. As a business projector, the native resolution of 640×480 isn’t quite as practical as I’d want. It also weighs in at around 3 pounds (1.3kg) so there are lighter options for business use. At home though, this mini projector is great. I definitely think this projector is more suited for the home doing movies and slideshows because of the great connectivity and projection brightness being slightly better than some others in the same low price bracket. You could project it onto a fence for an instant pool party, paint a wall white and use it for big screen movies (popcorn not included), or even load it up with the Wii or Xbox and get busy gaming! There’s a few accessories available if you want to use some of the extra connectivity options like HDMI. I’d probably recommend stopping by Amazon, you can usually get a good deal on shipping and pick up all the accessories you need. Expect to pay around $150-200. Sci Fi To Reality: A Roll Up Computer Monitor?